Thank you to Kate Messner for sending me a signed (in metallic blue ink, no less!) copy of her latest middle grade novel, Sugar and Ice (Walker & Company, 2010). Kate's first novel, The Brilliant Fall of Gianna Z. (2009) won the E.B. White Read Aloud Award for Older Readers, and Sugar and Ice shares that book's warm narrative voice and its variety of interwoven topics and themes. Gianna Z. and Claire Boucher are also similarly realistic, well-rounded heroines. But when Claire accepts a scholarship to train with elite figure skaters in Lake Placid, her life--and her skating--tilt a bit off balance. I've heard this book described as "Mean Girls on ice," and Claire definitely encounters some of those. 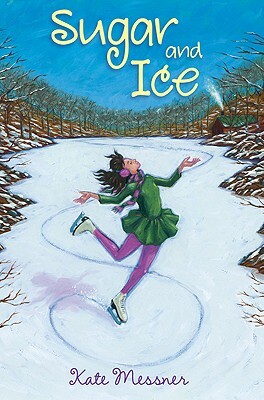 There's so much more to Sugar and Ice than mean girls, though: Claire has to deal with her own fears and anxieties about skating competitively (or not), as well as her relationships with Russian coach Andrei Groshev and the other skaters, both friends and rivals, training with her at Lake Placid. Not to mention everything that's going on--with or without her--back home in Mojimuk Falls. I especially love the way Sugar and Ice encompasses more than the world of competitive figure skating (which is fascinating in itself, especially if figure skating is your favorite winter Olympic sport). Claire's family's maple farm, her friend Natalie's beekeeping hobby, a school project about Fibonacci numbers all coexist with skating in Claire's life. Pair Sugar and Ice with a nonfiction book about any one of those topics for a rich (and sweet) reading experience. Thanks, Kate!